This article describes how to use hyperlinks to ELMA objects in reports using both FastReport and Razor forms. 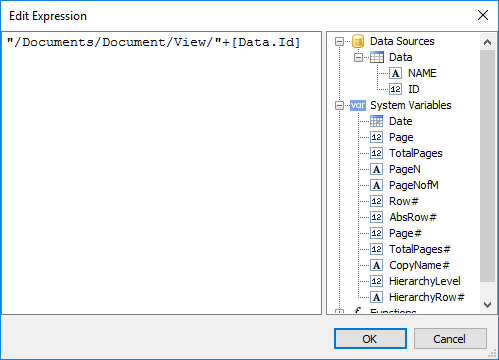 This article is useful if you want to create a report with hyperlinks to documents, tasks, projects, object instance, etc. We will consider three examples of creating a simple report with links to similar system objects using the FastReport form, complex reports with links to different object types using FastReport and using Razor markup. In ELMA, a link to a page consists of the server address, a constant part, which is the same for all the objects of a certain type, and the object ID. https://elma.server.com/- server address (for a local server the address may be 127.0.0.1, but such an address will work only on the machine that runs the server). The constant part is different for different task types. EqlFilter is the EQL query. Let's take a look at an example of how the link is created. 1. Create an EQL query (fig. 2). This query allows you to select the instances of the P_ProcessAgreement process that were launched by the user with id=1. 3. When you enter the link into the address bar, you will be shown process instances according to your EQL query (fig. 3). The spaces in the link are replaced with %20. Let's create a report that shows all the archived documents. This query selects the name and ID of a document management object. The ID will be later used in a hyperlink to the object. Open the Report Layout tab and add the Id and Name columns to the FastReport form. 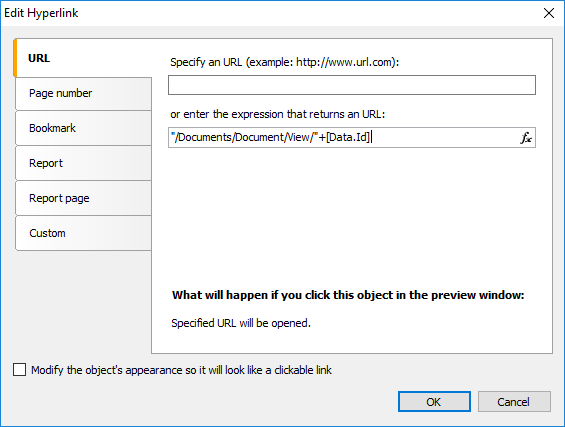 To add a link to an object, right click on the Name field and select Hyperlink. Since links to documents have different IDs, you need to add to the second field a formula for calculating the address. Check the box Modify the object’s appearance so it will look like a clickable link. To make it easier to enter a formula, you can click on the icon to the right. The Edit expression window will open, where you can add data, system variables, and functions by dragging them from the right column. Close all the windows by clicking OK and start debugging. You will see your report, with document names highlighted as hyperlinks, clicking on which opens the page of the respective document. This article in the first of the three articles dedicated to creating links in reports. To learn how to create a report with links to different object types using the standard FastReport form, read this article. To learn how to use links in a report with Razor markup, read this article.